This year I declared myself thankful for some of the technologies that help bring my family together. The tools have clearly gotten easier and more familiar to people who don’t live so much of their life online like I do. I found this year that the tools I was showing off all provided some real value in my family’s lives, and it wasn’t such a hard sell for me to explain why I spend so much time in that world. Here’s a quick rundown of some of what I mean. I made Moo stickers from some of my photos on Flickr, and gave them out when I saw my nieces and nephews at Thanksgiving this year. 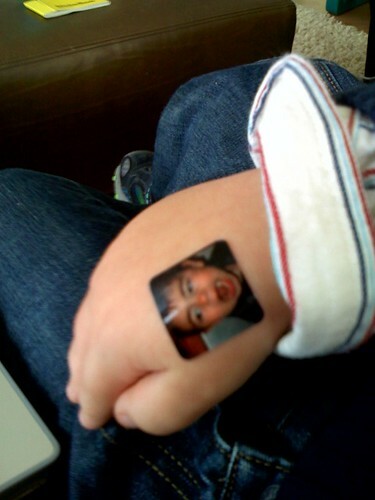 Noah was thrilled to have a sticker of himself to wear on his hand. Flickr and Moo work seamlessly together, and there was a lot of talk about stickerbooks for Festivus. Speaking of Flickr, Noah, Jake, and Milly were also amazed at how I could take their pictures with my iPhone, and then in seconds they could see themselves on my computer on Flickr. Earlier this year I set up a Slingbox at home so that I can share Oakland Raider games with my dad back in Rhode Island. The device was around $130. He can now control my television remotely, and for the most part it “just works” for him though he sometimes has to restart his XP machine to get it working. It seems to work every time without problems on my mom’s MacBook Pro. We share commentary throughout the games via SMS. Just a year ago I would not have imagined that we’d both be texting so much. I never had to explain that when you have something short and declarative to say, a phone call can be clunky and text is really the best way to go. I also showed my dad how to use his DVR so that we could time shift the LSU/Arkansas game when I had a change in plans and couldn’t be around for the live game. That caused some frustration when the game ran extremely long and the DVR decided not to record the three overtimes, but we used the internet to catch up on what we missed. My folks loved that we could skip commercials and watch the game much faster. Time shifting reduces the stress that comes from trying to accomodate everyone’s individual schedules during a short visit. Seesmic pretty much “just worked” in conjunction with my Macbook Pro and the great advantage over a video camera was that there was no delay between shooting the video and seeing it up online. That can make a big difference. 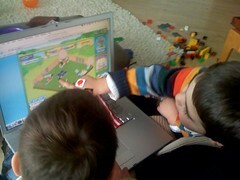 Rachel and Noah and Jake also gave me a tour of the world of Webkins. It was neat to me that they and their parents “got it” as far as the fun of socializing online and doing things that aren’t just traditional games. Noah bragged all day about the job he did in Webkins, painting a fence to earn some cash to get more jewels for his crown. He wanted to do another job right away, but there’s an 8 hour waiting period between jobs and he kept asking me to check again to see if he could take on another one. Who isn’t happy for Dora? Any 70+ folks in the crew? Interested in their take on your technologies. My 93-year-old grandmother is a big computer solitaire fan, but nothing from the Internets has really clicked.